My reflections during Sabbath, along with the stories I wrote, allowed me to have a sense of humor in a world that too often feels cruel and frightening. In less than two weeks, Paula Hartman lost her mother to Lou Gehrig’s disease and her father to a massive heart attack. She found her way through the sadness by using the Sabbath for rest and spiritual health. 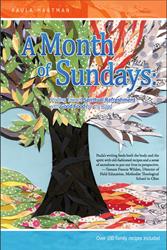 Instead of allowing herself to crumble from the awful pain, Hartman chose to find comfort in writing and the rest and worship of the Sabbath. She spent ten years after her parents’ deaths creating short stories that helped her maintain her sanity and restore joy in her life. A Month of Sundays is a compilation of these stories. Although always a writer, Hartman worked as a medical technologist in the lab of a large hospital in Akron, Ohio while raising her children. She, like many other working wives and mothers, knew the stress of trying to find the right balance. The Sabbath offered a day in her hectic week to take a step back and remind herself of what was important. Hartman has since left her career in the medical industry to become a fulltime writer. She hopes to teach others about the importance of cherishing what they have instead of constantly striving for more. Even in the midst of profound sorrow, she feels, there can still be hope and joy. For more information, visit pauladeanhartman.com. of seven grandchildren. She understands the complexity of balancing work and home and the need for true Sabbath rest. She lives in Seville, Ohio.